Katoomba, NSW. The Saga of the Explorer’s Tree continues… | Sconquest. ← Explorers Tree, Katoomba. Well & Truly Past it’s Prime! Australia’s Original Blarney Stone (Tree)! Fact or Fiction? Does it matter? Seemed such a simple story but it isn’t. Apparently, it is questionable whether the tree was ever marked in 1813 by the explorer’s Blaxland, Lawson and Wentworth. Quite innocently, just looking for pictures when I found this image and an excellent discussion of it’s questionable history and existence, on the Six Foot Track Marathon Website. The Explorers Tree is by the main Western Highway and marks the beginning of the Six Foot Track, where the race also starts. A few years ago we did part of the Six Foot Track, namely the descent into the Megalong Valley which was steep but fine until we had to go back UP the way we’d come, to get back to our car. Next time I might take a horse, that’s why it’s six foot wide and was made as a bridle track. Here’s the details for the three day 45 km walk or the guided walk. It’s on my list of to do’s. Ever heard of blazing a trail or scarred trees? It’s not a fire but square or triangular marks cut into the lower trunk of a tree by surveyors. Ahah! I’ve seen old metal ones before but thought kind folk did that to mark a walking track. Probably, it was the same thing originally. Anyway, in 1884 they blazed a trail from the Explorers Tree down the Megalong Valley and across to the caves we now know as Jenolan Caves. However in 1901, the predecessor of Sydney’s Powerhouse Museum ordered 3 timber samples to be taken from the Explorers Tree, which was a White Mountain Ash (Eucalyptus regnans). It still has one marked “Part of the tree marked by Blaxland – Lawson – Wentworth – being the furthest distance recorded in their first attempt to cross the Blue Mountains. A.D. 1813.” Couldn’t find a date for when the tree was actually lopped but it maybe around 1894. Wonder if the specimen was from the top or the stump that survives today? Intertwined with the story of the Explorer’s tree is competition for the tourist trade to the Caves, which were discovered about 1838 and soon attracted the interest of travellers before being proclaimed as Jenolan Caves Reserve in 1866 and as Jenolan Caves in 1884. At first, there were honorary guides until 1867 when a Keeper of the Caves, Jeremiah Wilson was appointed who was granted land in 1878 to build the original Caves House. Afurther two stories were added by 1887 but it all burnt down in 1895. Here’s an excellent book on the caves called Beneath the Surface from google books. The Caves had electricity from 1880, long before Sydney did in 1904. In 1884, the Six Foot track was proposed as a shortcut to the caves as Katoomba was being bypassed by the train to Mt Victoria where there was a train connection to Tarana. In 1879, Tarana was the only town where it was possible to take a coach all the way to the caves, a monopoly which it enjoyed for ten years. Next we return to Trove and explore the rivalries and follow the demise of the Explorer’s Tree. It’s all about competition. There’s so many wonderful stories and pictures which I may include in the future. 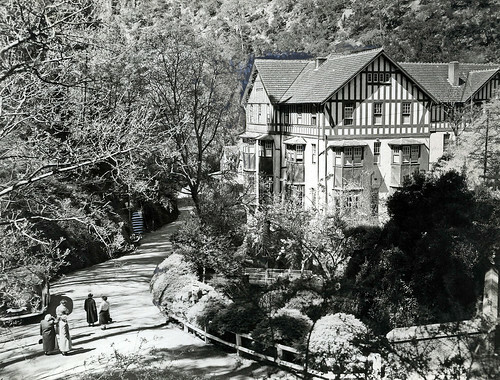 The three Grand Hotels in the Blue Mountains included the Imperial Hotel at Mt Victoria opened in 1878. Katoomba’s Great Western Hotel opened in 1882 and was renamed the Carrington Hotel in 1886 after Lord Carrington who also features prominently in the story of our tree, the Medlow Bath Hotel and Palace which became known as the Hydro Majestic opened in 1904 and had a portion of the Explorer’s tree still in 1910. 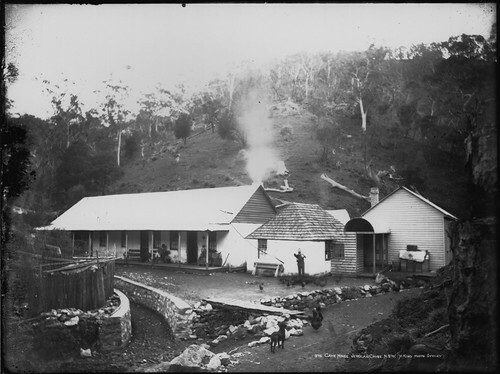 Below is the original caves house and the new Jenolan Caves House which was rebuilt in 1898. 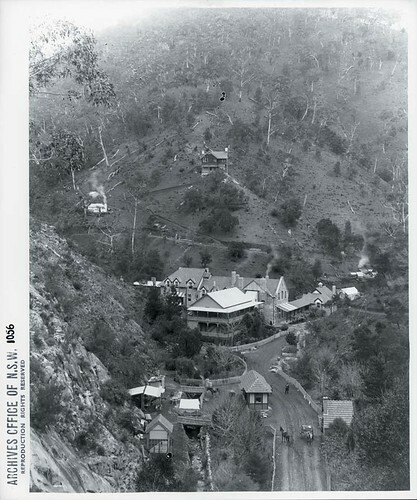 In the 1880’s Mt Victoria became the ‘Gateway to Jenolan Caves’, or so they thought. It seems that no-one had heard of the Explorer’s tree before the Six Foot track was proposed. None the less, it was an excellent means of diverting unsuspecting tourists to Katoomba instead of Mt Victoria by saving them a lot of travelling time and discomfort. Perhaps the Powerhouse Museum, State Library of NSW or the Art Gallery of NSW may have some old pictures or documents that might shed a different light. Regardless, it was extremely successful. In 1888, an article promoting the Blue Mountains made no mention of the Explorers Tree but included a poem by Henry Lawson called “The Blue Mountains” The Words are here. No matter who questioned it’s authenticity, it wasn’t what people wanted to hear so the Explorer’s Trees’ story survived, especially once Federation and World War I were approaching. Today, it’s still a good rest stop for travellers. What will happen in 2013 to commemorate 200 years since the Crossing of the Blue Mountains? Planting a new tree with a proper monument to all our early explorers, including George Bass, would be great. Add The Explorer’s Tea Rooms and tell the trees’ many stories and it would be just perfect! This entry was posted in Attractions, Blue Mountains, Bushwalk, New South Wales and tagged 1813, 200 years, 2013, art gallery nsw, australia, bass, blarney stone., blaxland, blue mountains, carrington hotel, crossing, explorers tree, hydro majestic, imperial hotel, jenolan caves, katoomba, lawson, megalong valley, monument, Mt Victoria, powerhouse museum, six foot track, state library nsw, tea rooms, trove, wentworth. Bookmark the permalink.